Enter your email address below to sign up for our monthly farm news. In addition you can sign up for weekly updates about what is in season at the markets closest to you. For new visitors to the Factory, in addition to the Farmers' Market, it contains a great variety of retail shops, restaurants, arts, etc. There are also almost weekly special events from consignment sales to auto shows to toy shows. It is definitely worth a visit to www.factoryatfranklin.com before your first visit to see all that is offered and for special events. The Farmers' Market is located in the parking lot at the rear of the Factory. Our booth is at the opposite end of the shed from Liberty Pike. From Franklin: Go north from the square on Franklin Rd. The Factory is 6 blocks on your right. 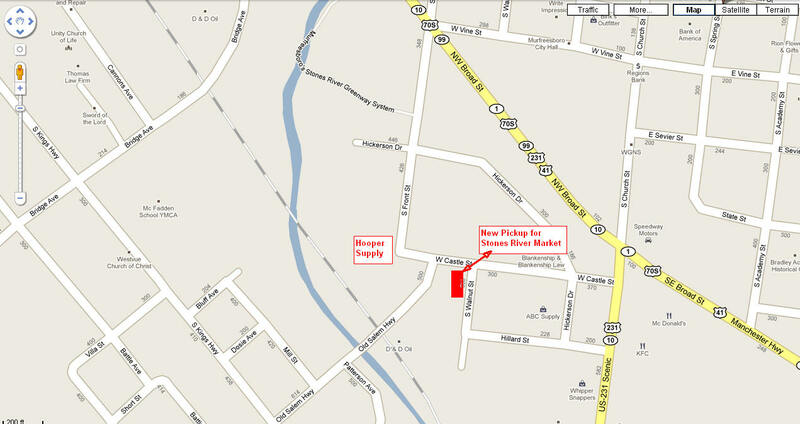 The easiest way to the market is to turn right on Liberty Pike and then turn left at the rear of the Factory. Stay straight upon entering the parking lot directly in front of you.